PowerPro24 | Constant Tension | Magnetic Technologies Ltd. 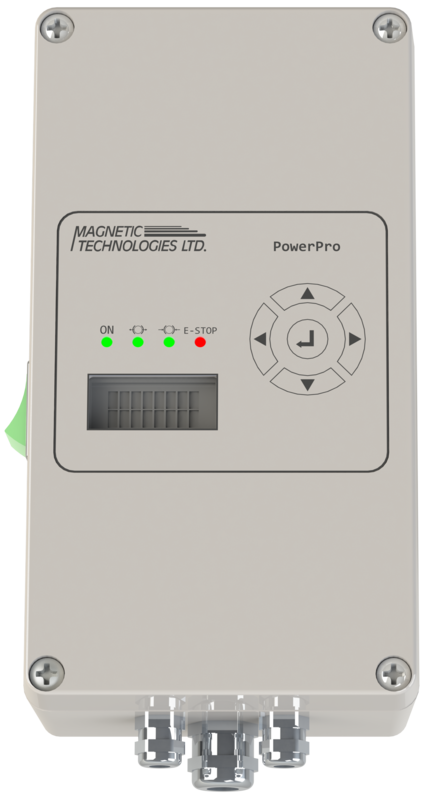 Magnetic Technologies PowerPro24 (MPP24) is a modern, microprocessor controlled constant current digital power supply and tension controller. MPP24 is specifically designed for use with our line of Electric Hysteresis Brakes. We have been involved in the wire, cable, and tension-control industries for over 30 years, transforming it from leather and rope brakes to permanent magnet brakes for better tension control. However, in the 21st century, the need for even more precise tension control is becoming more prevalent, and maintaining constant tension in payoff applications has become a necessary prerequisite for precision manufacturing in the industry. When we began building constant tension controlled payoffs, we found the industry offered no complete tension control solutions. The solutions that were available required numerous expensive and complicated components and days to setup, calibrate, and tune. As we encountered more applications that required precisely controlled constant tension, we used our experience and expertise in the field to develop the first fully integrated tension controller power supply. After years of development, the MPP24 has allowed us to increase tension accuracy, decrease packaging size, and decrease system complexity, all while significantly decreasing total system cost. The user selects a current output. MPP24 will adjust voltage as the brake heats from normal use to achieve a constant current output and thus constant torque from the brake. Current output can easily be changed on-the-fly. Current is controlled via a 0-10VDC input signal. This input can be from an external source such as a programmable logic controller, a voltage divider follower arm (utilizing the onboard 10VDC power supply), or any other 0-10VDC signal source. Sophisticated control algorithms are used to achieve constant tension control. An ultrasonic probe is used to measure spool diameter. The user enters a desired tension value and MPP24 constantly adjusts the brake to maintain constant tension. 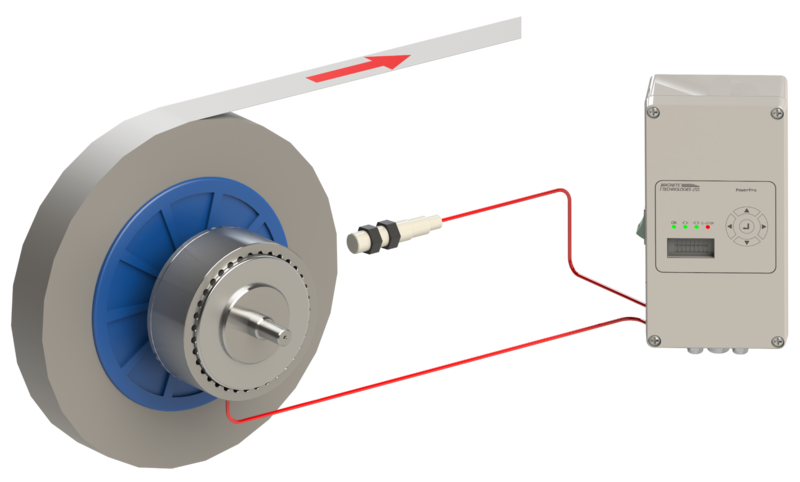 Strain gauge mode uses an inline roller load cell to monitor line tension. The user enters a desired tension value and MPP24 uses a PID control algorithm to continuously adjust brake torque to achieve constant tension. At a fraction of the cost of a traditional tension controller, the PowerPro24 fully integrates the entire system into one compact device. An ultrasonic measurement probe is used to measure spool diameter. The probe must be powered by an independent 24VDC power supply. The probe supplies a 0-10VDC signal to the power supply. PowerPro24 is the first fully integrated tension control system. Everything you need to build a constant tension payoff is built-in. 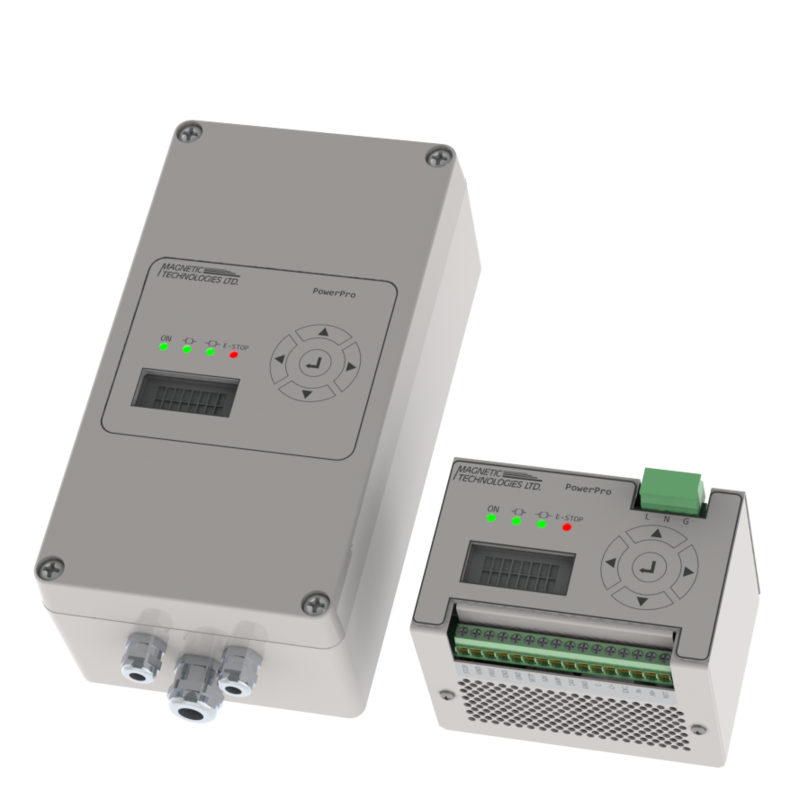 With support for English and Metric units as well as automatic adjustment for 110V or 220V input, PowerPro24 can be easily used anywhere your manufacturing process takes place. 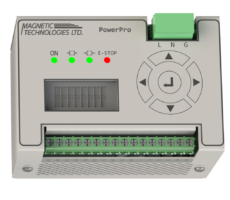 PowerPro24 automatically limits output current based on the brake in use, protecting the brake from damage. Changes to current and tension values can be made while the system is running. No need to stop the process to adjust brakes, just use the keypad to enter the exact tension value desired. Our power supply is programmed with specific performance curves for each brake model, allowing for precise open-loop tension control. For multi-position payoffs, our 7″ touchscreen display interface makes setup and management of a large system manageable.